How the latest $1.1 trillion spending bill will help boost investment in solar energy. Thomas Edison was finally heard this month when President Obama signed the $1.1 trillion spending bill, which now allows U.S. producers to export crude oil, but, and some believe more importantly, also extends the investment tax credit (ITC) for the solar (and wind) power industry another five years. According to Bloomberg New Energy Finance, this swirl of the pen basically doubled the current solar power business in the United States. The result was a surge in solar energy stock prices, including SolarCity (SCTY), the largest rooftop installer of solar panels, which jumped 34% off the news, and SunEdison (SUNE), which spiked 25%. And anyone who thinks Goldman Sachs isn’t tied into the government should now be disavowed of that belief: In November Goldman Sachs announced a quadrupling of its’ financing in clean energy projects to $150 billion. 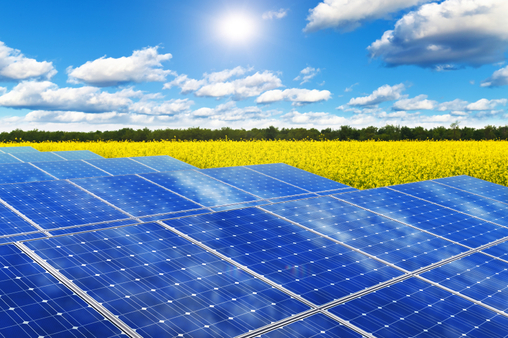 Solar energy has been around for decades, and has had its bright and dark days. But in the past two years there has been major investment growth. According to the United Nation’s Environment Programme’s “Global Trends in Renewable Energy Investment 2015” report, global investment in renewable power (excluding hyroelectric power) was $270.2 billion in 2014, 17% higher than in 2013. The key here was a global boom in solar installations, with China and Japan spending $74.9 billion. In addition, investment in developing countries was up 36% over the previous year, to $131.3 billion. The study also found a key to solar power’s sustainability was cost cutting, which helped push investment in solar by 29% year-over-year to $149.6 billion. GTM Research states that the ITC five-year extension will result in 25 gigawatts of additional solar capacity over the next five years, “a 54% increase over a no-extension scenario.” It adds that this means $40 billion in incremental investment in solar power between 2016 and 2020. The firm believes that most of this investment will be in the “utility-scale sector,” where the ITC extension will increase deployments 73% through 2020. “Utility-scale sector” is defined as projects owned by regulated electric utilities or selling energy primarily in or through wholesale electricity markets, basically large “solar farms” or “solar fields.” GTM also sees “tremendous growth” in residential solar as well. Although acknowledging the “ITC is a huge deal for the solar industry, “ Morningstar equity analyst Mark Barnett is more circumspect on actual investment in solar companies largely because the key ingredient for positive growth and cash flow is the ITC itself. “We aren’t favorable on solar generation companies [because] the primary source of cash flow is the subsidy,” he says, adding that all economies being equal, if the only cash generator for a company is a government hand out, that’s not a solid reason to invest. That said, if valuations were attractive or undervalued, Morningstar certainly would take an interest in the stocks, he says. He adds the cost cutting in the industry largely has been the drop in solar panel prices, not necessarily operational expenses. Despite these cautions, Barnett agrees “the world has changed” and clean energy is the future. Bottom line: investors are lining up with Thomas Edison, not only based on the U.S. spending bill, but the recent Paris Agreement on global climate change and reduction of greenhouse gases. The world, even petro state Saudi Arabia, is moving toward clean energy, and solar seems favored across the globe. Even public pensions have invested, including California State Teachers’ Retirement System, a bellwether for pension investors. CalSTERs doubled its clean energy investments in late 2014, planning to spend $3.7 billion over five years. “In short, the ITC extension is a game-changer and accelerates the timeline for the next stage of solar. We’ll hit nearly 100 gigawatts of cumulative solar by the end of the decade — after starting the decade with less than 2 gigawatts,” said GTM’s MJ Shiao, director of Solar Research in a post-ITC roundtable.